Let us quote on all of your custom steel stamp requirements. 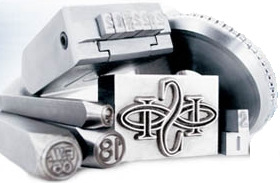 Our high-quality, hand-cut steel stamps are handcrafted to deliver to you a sharp and precise industrial marking device. • Superior-quality tool steel stamps are manufactured with a hardened and tempered steel. • Beveled ends prevent stamps from cracking and fraying. • Rust-resistant finish and uniform dimensions created for a superior stamp. • Create custom steel stamps in any size. To receive a price quote, email a clean and crisp black and white copy of your original artwork or text information needed and we will be happy to assist you with your special quotation. Please Note; All special ordered stamps are non-refundable.